Come and live the local life in the Bastille district! In the heart of one of Paris' most historic and authentic areas, our entire team will be delighted to say "Hello" and welcome you with generosity and simplicity. A stay with us is a unique opportunity to discover a place packed with character, meet a friendly team and leave with a story to tell! Our spaces are inspired by the local neighborhood, where everything revolves around style, entertainment and comfort. Intensive revegetation has made this area the lungs of the neighborhood. Somewhere between Brooklyn and a Parisian workshop, we are defined by authenticity! We offer bespoke services and assistance with the running of your events. Just a short walk from the Marais, place des Vosges and Bastille Opera, close to the Halles, the Louvre museum and the city hall. Our restaurant offers a simple and generous bistro-style menu. You can enjoy dishes made with fresh ingredients and a selection of wines from passionate winegrowers, all in a true "home from home" atmosphere. 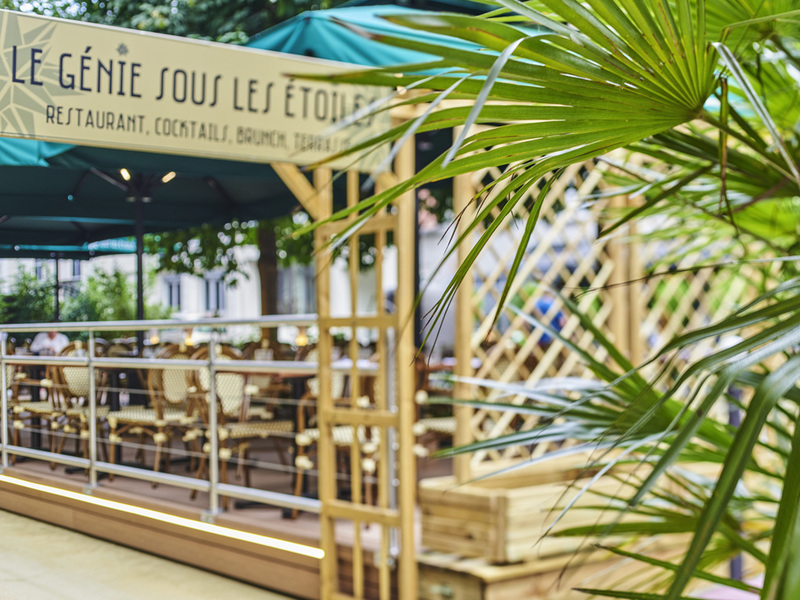 Welcome to the Génie Bar with its trendy atmosphere reminiscent of Brooklyn and the Bastille quarter, where you can discover our cocktail creations inspired by our garden produce or let the barman guide you through our carefully selected range of alcohol. Good - but it was awful to be woken by house keeping staff on the last day. Overall it was good. But on the day I was due to checkout the housekeeping staff opened my room door at 9.30am waking me up. I don't think the house keeping staff should do that on a morning that people are checking out. It woke me up and ruined my experience. Hotel room was compact but very clean and comfortable and the shower was good. The staff were friendly and helpful and breakfast was tasty and plenty of choice. Overall, the hotel was very good value and in a great location, within walking distance of a Metro station and the Seine. Stay was good. Breakfast was good. Staff were friendly. But house keeping is not so good. Left wet cleaning cloth on my personal belongings and toothbrush was on the toilet floor. This part is disappointing. In general stay was ok as usual besides really unfriendly / unprofessional barman. I usually stay in this ibis, rooms are small bit the location is perfect. Yet this time i was very disappointed, after becoming a gold accorhotels member, and even paying 470€ for 5 nights, they gave me a free drink for one person although we were two! I find this extremely disrespectful. Too small toilet & room. I arrived at the Hotel a few hours late because of a strike by air traffic controllers.I was then told that my room was no longer available, although I had booked well in advance on the Ibis website, and I would be sent to a different Ibis hotel in Paris.The hotel said they would pay for the taxi.However arriving at the different hotel the taxi driver told me that I would have to pay him directly.I was eventually reimbursed by the Hotel but found the whole experience unpleasant and stressful. The only imperfection was that there was noise due renovation during my stay, but I guess that is unavoidable. Everything else was great. A great employee at the check-in desk! I had a great stay. I traveled with a friend and we wanted to find a decent hotel in the Bastille area so as to be convenient to the metro, easy to walk around the city, and a place that was clean and comfortable. This is not a luxury hotel, but it checked every box! Love the lobby, which is full of plants and comfortable lounges. We did not try the restaurant or bar, but they appeared to be very nice. At least one night there was live music in the bar. As a regular customer I found the experience brilliant as usual. the staff are really helpful and accommodating. The power was off to the room when we checked in. The staff were friendly and courteous. Good stay. Would happily stay in an ibis hotel again. Comfy hotel at reasonable price. Speedy check in, comfortable beds and quiet. There was renovation work at the hotel when I stayed there 13-18 March. It was very noisy in the morning. The people in the room above mine came back late every night and made a lot of noise walking about so I could not sleep. The cleaners were also very noisy, slamming doors and shouting. It was very difficult to sleep at the hotel. I asked to change my room but the reception staff were not very interested to help and just said that the hotel was full. If you are going to carry out renovation work while the hotel is open you should post a warning message on the Accor website and offer a discounted rate during the period of the work.